I remember clearly when construction work started on CeBlue on Crocus Hill Anguilla. I had mixed feelings about it. 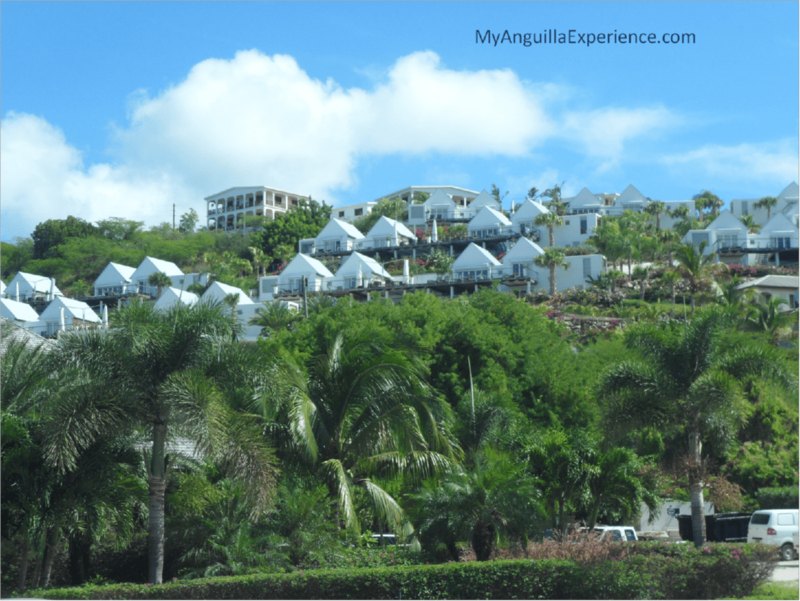 I felt like it would totally change Crocus Hill and Crocus Bay, a beach and area which holds such fond memories for me. While growing up my aunt lived about 200 yards from the top of the hill so walking up and down the hill to go to the beach was something my cousins and I did regularly. As an adult, I continue to walk up and down Crocus Hill because it is a great workout. Shantelle and I started exercising on the hill in 2008. Three mornings a week around 5am or 5:30am we would start at the top of the hill and walk up and down the hill a few times. Over the years we watched, the workers clear the land, pour the foundation, put up the steel and build the walls and start landscaping. We tried to imagine what the finished product would look like but we could not visualize a luxury boutique hotel during those days. I had intended to visit CeBlue on Crocus Hill and to get a full tour for a while so I was happy when my friend Patricia decided to have her birthday celebration at the restaurant (The Blue Bar, CeBlue). When I entered, I was pleased by the décor at the restaurant. It was a nice, cozy and private atmosphere as my friends and I can sometimes become a little loud and chatty when we are together. It was night, so we could not enjoy the view but I am sure it is spectacular. There were eleven of us there and each of us ordered our own pizza and shared tapas like style. That night I sampled a wide variety of the pizzas available on the menu and I liked each one. The pizzas we ordered included the Classica which main ingredients were spinach, sea salt, ricotta and mozzarella, the Polpettina, with meatballs topping and the Romano whose main toppings were the grilled chicken with peppers but Sherma swapped the chicken for the prosciutto. Nash and Jay had shrimp and mussels and of course there were those who ordered pepperoni pizzasJ. The pizza I ordered came with calamari but as they out of calamari, I ordered it with shrimp and it was yummy. Despite a few gaps in service delivery, my friends and I had a great time. Many of the persons at the celebration were my past co-workers so there was a lot of catching up to do. At one point we were talking about ‘Mocha’ Shantelle’s dog (yes Shantelle has a dog) and I couldn’t help but announce that I never thought the day would come when Shantelle and her dog would be a topic of conversation. 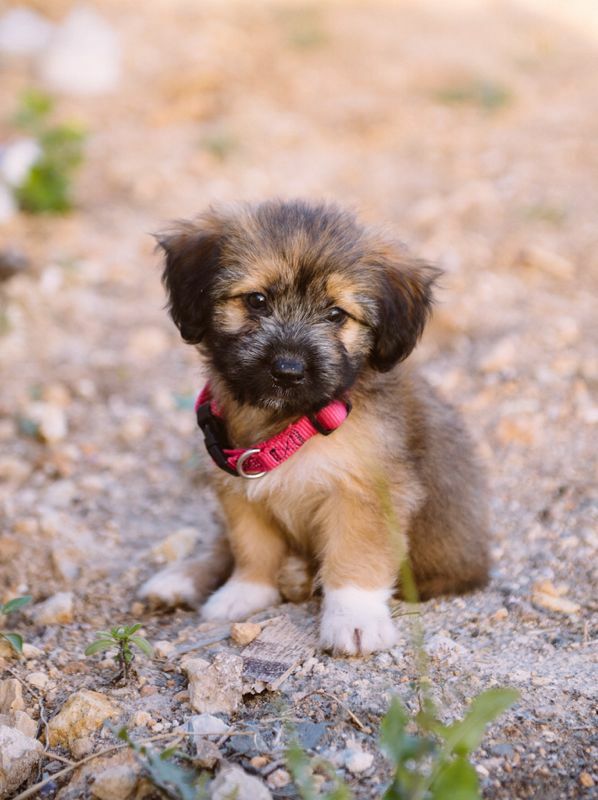 Mocha is a cutie though, so it is easy to fall for her. Don’t you agree? 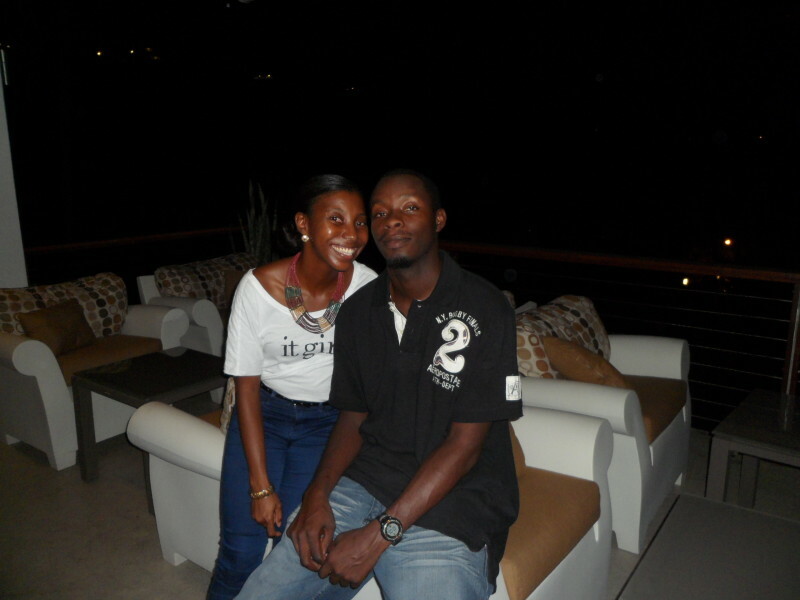 But back to the main reason for the event, the birthday of my lovely friend Patricia. Patricia owns a cute shoe store called ‘The Shoe Lounge at Divas’ so a fitting cake for her birthday of course portrayed a fabulous pair of shoes. 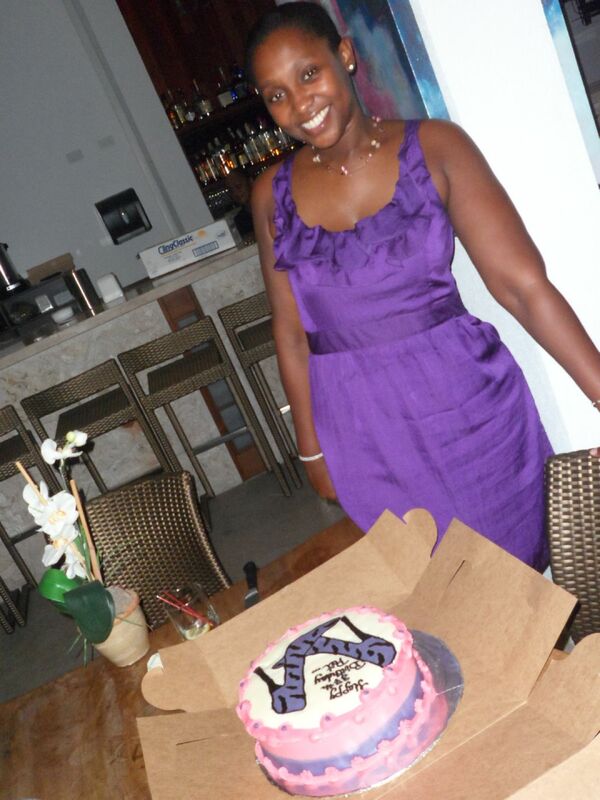 The cake was baked by Eva of Eva’s Awesome Treats (E.A.T). Check out the Shoe Lounge at Divas for beautiful and unique shoes in Anguilla. 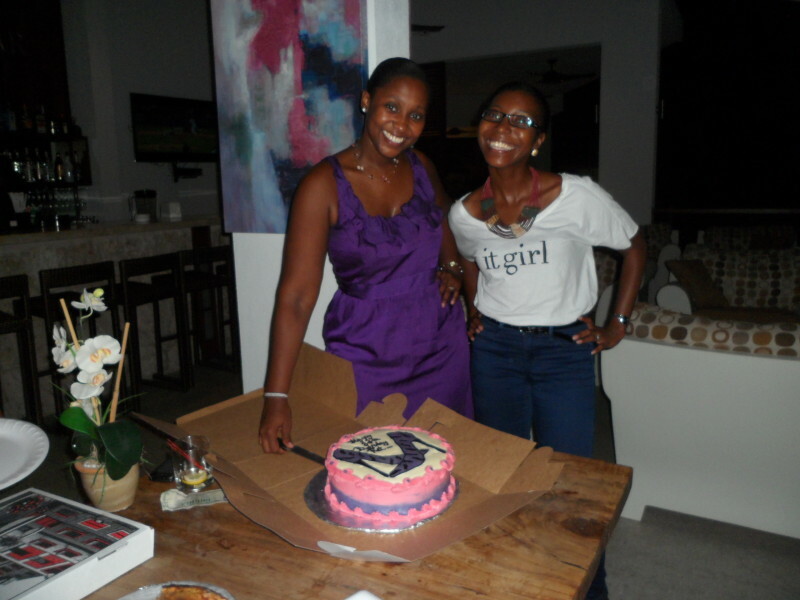 It was a wonderful night with friends and as I said in my six things I love about Anguilla blog post, many outings in Anguilla involve food. We left the restaurant stuffed and laughing. Six of us hitched a ride on the golf cart back to our cars and the rest said something about ‘good exercise’ walking down the hill. It was a great night with good friends and I look forward to exploring CeBlue Villas and Beach Resort some more in the near future. 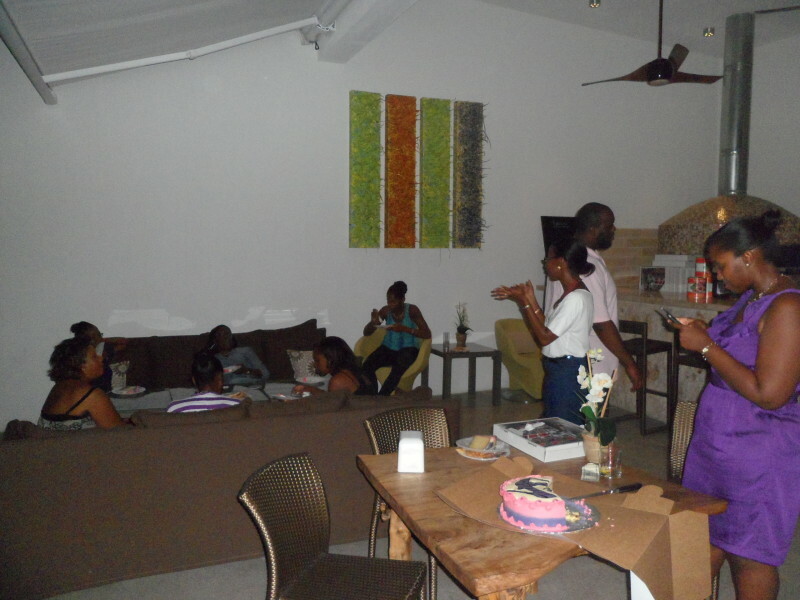 Have you visited CeBlue on Crocus Hill, Anguilla? Leave us a comment below. Sounds like you had a fun evening – is the restaurant open to the public? Hi Ellen. It was fun and yes the restaurant is open to the public. I haven’t seen much written about it yet. I see your thread was pulled on Trip Advisor – there are a lot of mean and jealous people on there – I suppose someone pushed one of the complaint buttons and that caused it to be pulled. Someone else resurrected it and I commented, I never understand how people can be so mean and petty. Thanks Ellen. There are mean people out there but positive people like you and others on Trip Advisor are sooo terrific. Thanks so much for your support and encouragement. I visited the Bar at Ce Blue about 3 weeks ago. Like you I had mixed feelings about the development and also Ani villa and art studios. Well I can say I am happy about Ce Blue. The view is heavenly and you must return to see it in the light. The food atmosphere, service all were excellent except i could not figure out the lock on the ladies room door and thought I’ll never get out and who would hear me down that long hall ! I finally managed it thank God ! I haven’t been to Ani but am hearing wonderful things about it. I do artwork so am dreaming I can come and study in the studios some fine day. You are a very pretty and talented young lady. I really enjoy your blog and wish you all the best.